Czar Press - You Design It, We Print It. YOU DESIGN IT, WE PRINT IT. Wholesale printing is what we do. You design it, we print it. 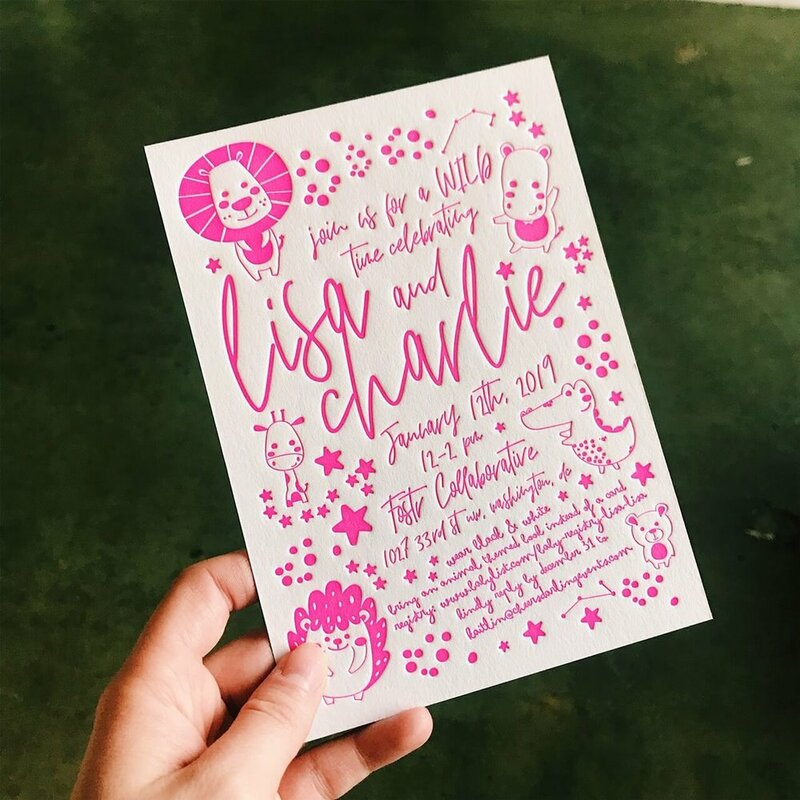 Send us your print ready designs and we’ll bring them to life with letterpress, flat printing, foil, screen printing, and embossing. We work with designers and stationers from all over the land, big and small. We’re happy to work with you whether you’re printing quantity 25 or 10,000; no quantity discrimination around here! Need a lightning fast turn around? We can make it happen with almost everything done entirely in-house. Czar Press will meet all of your printing and fulfillment needs with the highest level of quality, communication and service. How long is your turnaround? Unless otherwise arranged, our standard turnaround is 7-10 business days. We can and do accommodate rush orders for a fee which is determined on a case by case basis. To find out what a rush for your project will cost, email us at info@czarpress.com with the specs of your job, where your order will be shipping to, and when you want it in hand by. How do I need to supply my files? All files should be submitted as PDFs. You artwork should be final size; if you want a 5” x 7”, your artboard should be set at 5” x 7”. If your artwork requires a bleed (i.e. if your art has parts that go all the way to the edge of the paper), in your document settings, set the bleed to .125” on each side and extend your artwork to the edge of the bleed line. Your document color mode should be set to CMYK. All fonts in your files should be converted to outlines. All photos in your files must be embedded. The minimum line-width for letterpress and foil is 0.3; for screenprinting it is 0.5. If your lines are thinner than this, they will not properly expose onto the plate or screen. You can measure this in Adobe Illustrator using the pen tool. 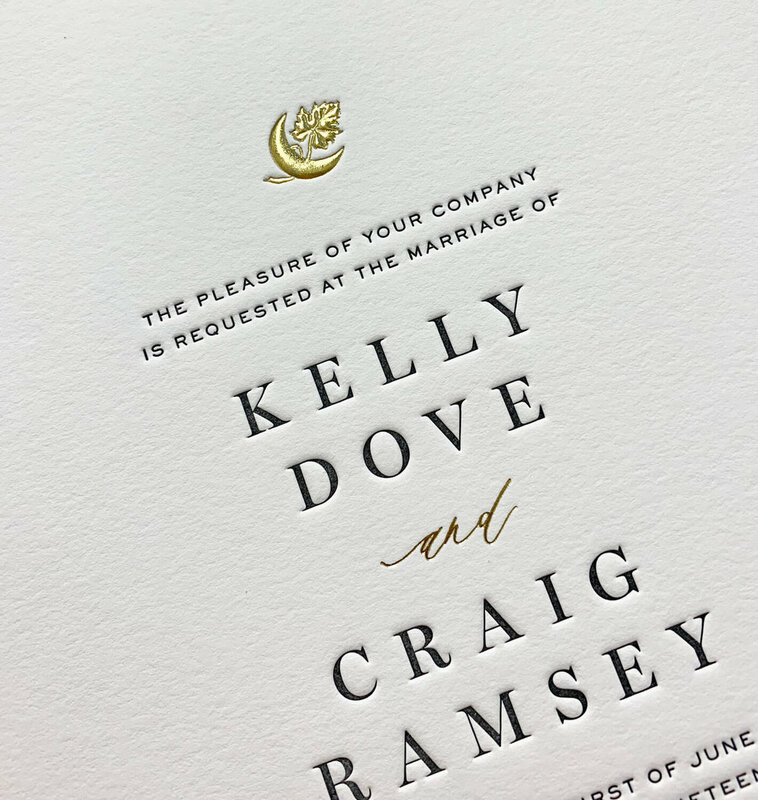 One file that is a full-color mockup with both the letterpress and foil artwork. This should look like what you want the final piece to look like. When your project includes having a return address printed on an envelope, you need to provide us with a mockup that shows us where on the envelope you would like your address artwork to be placed. Yes. 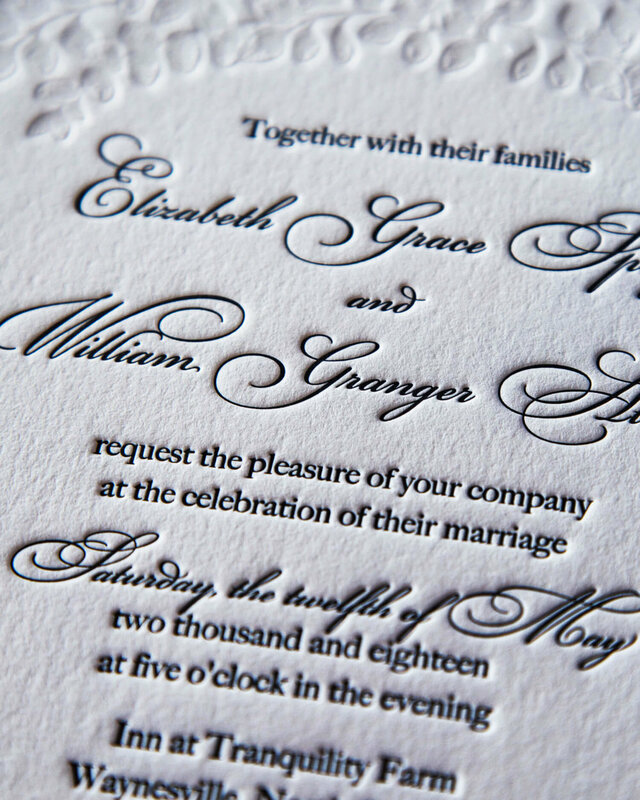 We can flat print, foil stamp, letterpress, or screen print on envelopes. 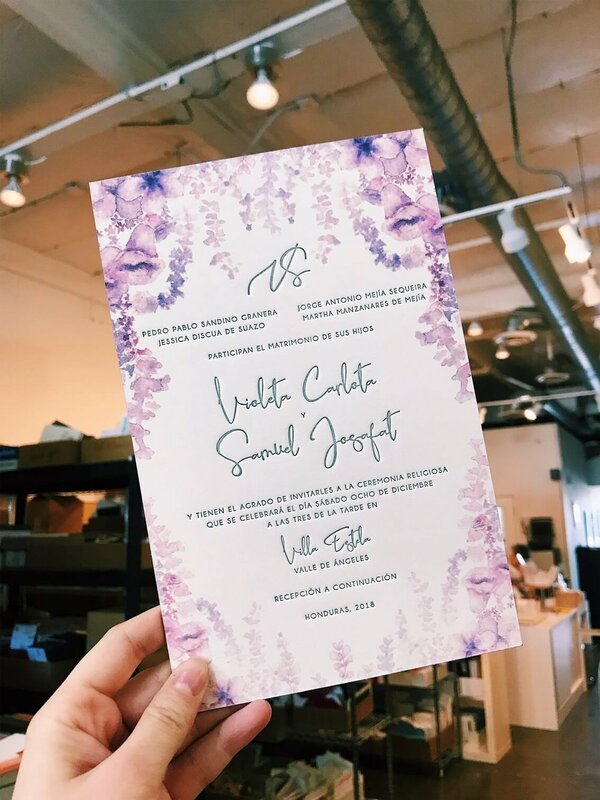 Guest addressing can only be done with digital as it’s unrealistic to make physical plates or screens for the large number of names that most events require. 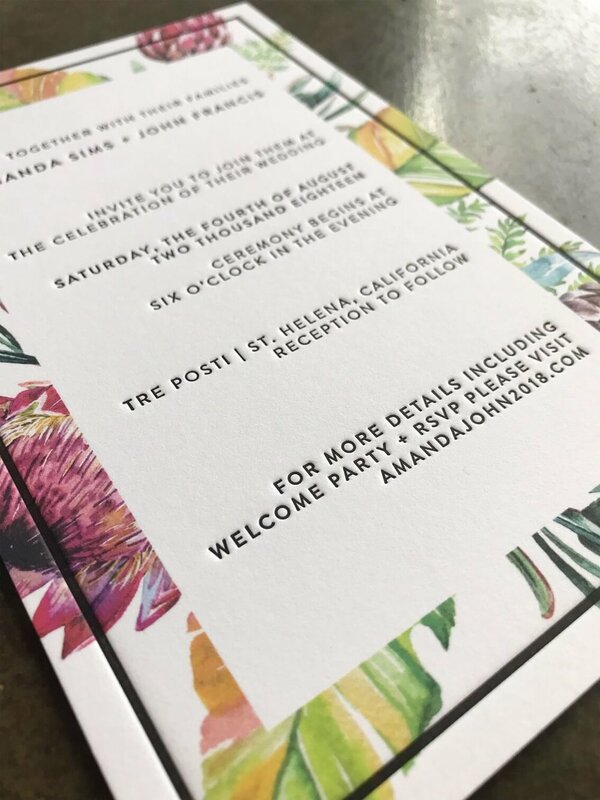 For digital printing we cannot print on envelopes smaller than A2 size (4.375" x 5.75"). Are envelopes included as a part of my order? We print physical proofs as requested. For physical proofs of digital pieces we charge $15. 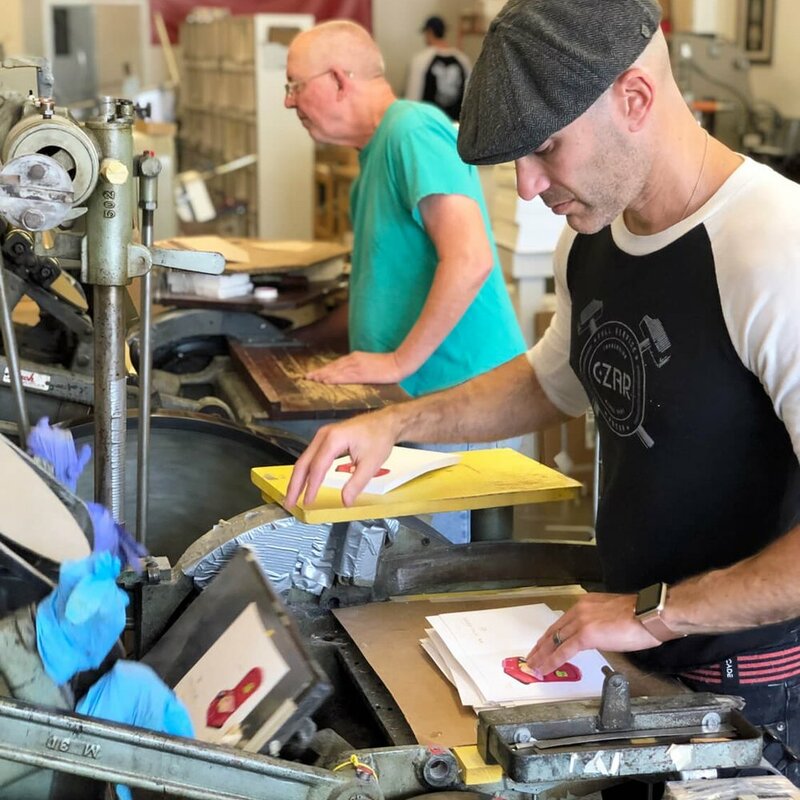 For letterpress, foil, embossing, and screen-printing, proofs are much more expensive to produce as we have to go through all the same steps that we would if we were running a full job, including making plates or screens that make up a large portion of the cost of an order. For this reason we need to charge you enough to cover the costs of the plates / screens used, as well as a charge for labor / setup (typically about $50 per plate / process involved). If you proceed with the existing artwork, the costs of your plate or screen is rolled into the cost of the full run so you are not charged twice. Any changes that are made to the artwork after receiving a physical proof (Letterpress, Foil, Screenprinting, and Embossing only) will require a new plate(s) to be made which you will need to pay for. We do not provide digital proofs as we make our prints directly from the art files that you provide us with. 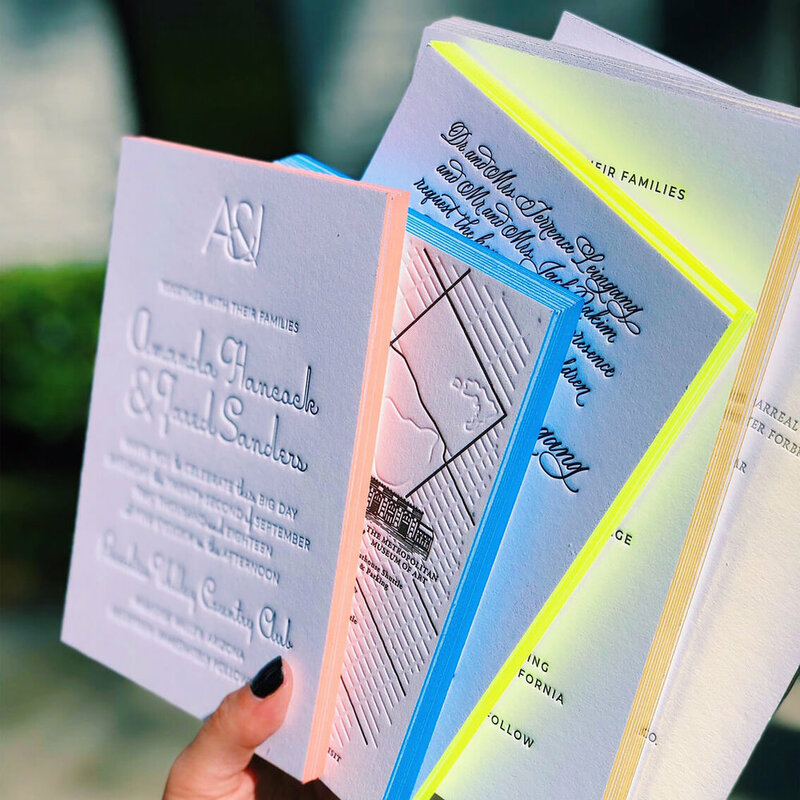 What is a Pantone book and do I need one? Pantone is a standardized color matching that printers, manufacturers, and designers across the world use to specify and replicate specific colors without having to be physically in the same place. What this means is that if you have a Pantone book, you can choose a swatch color, and any printer worth their salt in the entire world should be able to match to it. 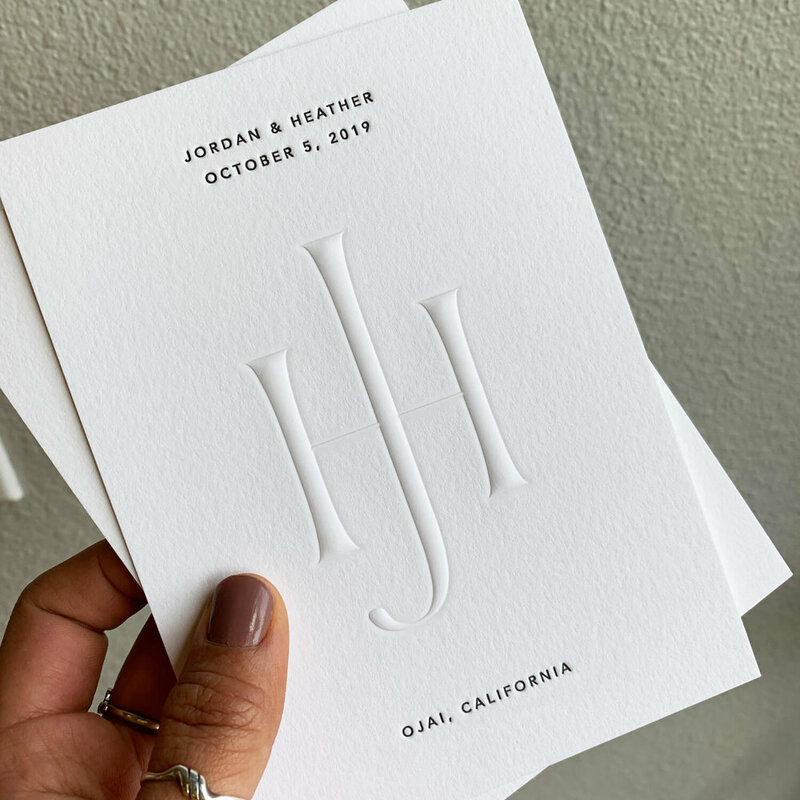 This is how our greeting card clients are able to pick a color for the card and we are able to reproduce that same color for years after the original run without needing a sample to refer to. Why does my ink color look different on the actual card from how it looks on my screen? Physical colors that exist in the real world are not the same as colors we see on our screens and devices. To make matters even more complicated, the colors you see on your computer screen are different than the colors I see on my computer screen, and those are different from the colors we both see on our phones. This is why designers around the world turn to the Pantone Matching System (See Above) when they want their printer to be able to match a specific color with perfect precision. TLDR: DON’T TRUST YOUR SCREENS! Do I need to pay a deposit before my order will be processed? Nope! We don’t require deposits, but we do ask that first time customers pay for their orders before we ship them out. Mike is a man of action and determination. Once he has his mind set on doing something, it’s usually not long until he makes it happen. It was this same blend of gut-feeling impulsivity and willpower that led him to start letterpressing stationery in his garage on a whim in 2007. 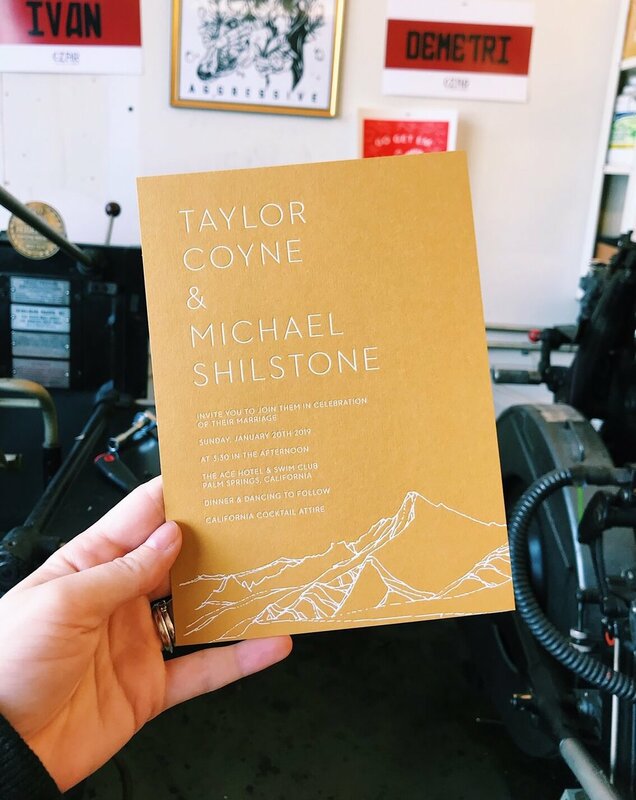 As Mike’s love for letterpress grew, so too did the business. Although Mike moved the company out of his garage, he made sure to take his “can do” attitude and grit with him along the way. 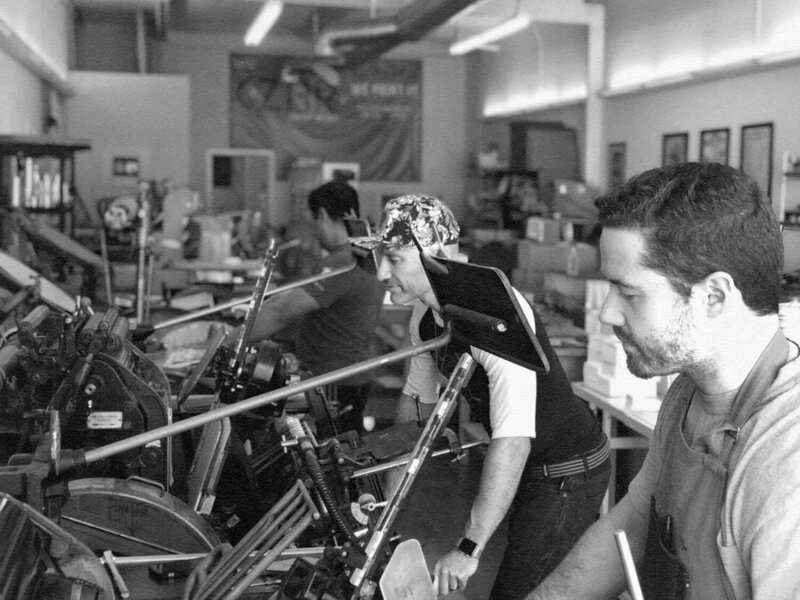 Today Czar Press consists of 10 employees, 11 presses, 2 trimmers, and thousands of cups of coffee (most of which were poured by the man himself). Mike is a New York native and lifelong disappointed Knicks fan. While he’s not taking care of business on the shop floor, Mike enjoys spending quality time with his wife Rachelle and their two daughters. He’s also a force to be reckoned with in the kitchen and has been dubbed by some as “The Male Martha”. Those who know him best will tell you that his letterpress skills are rivaled only by his Nachos. Daniel has lived in California for over 10 years, but originally hails from Nashville, Tennessee. In his spare time, you can find him drumming for his band Able Body. He spent 5 years letterpressing in LA, and has been our trusty printer since moving to Orange County in 2018. Annie was born and bred in Southern California. She has a BA in Media Studies from University of Redlands (Go Dogs!) and a professional background in marketing and print. She loves Shrek, French bulldogs and Ina Garten. 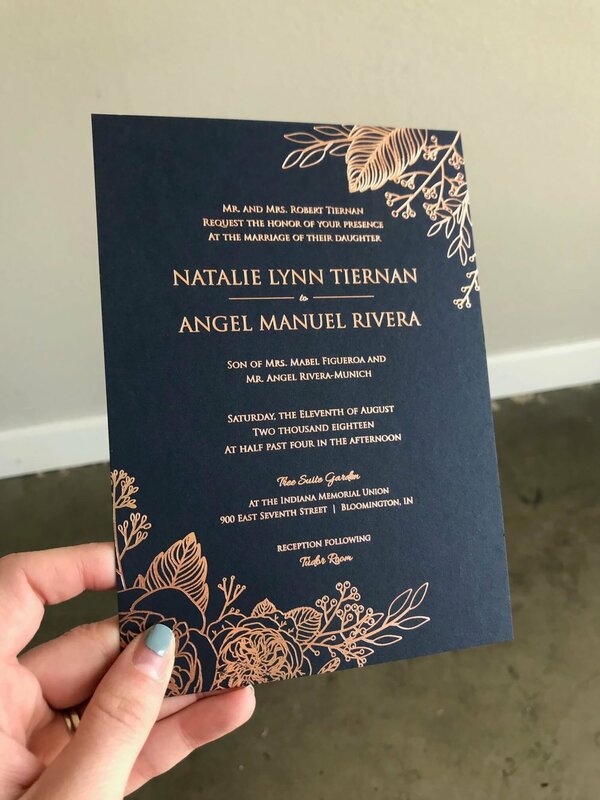 You can also find her designing wedding invites at gingerlydesignco.com. Originally from San Jose, California, Greg has wholeheartedly embraced the idyllic Newport Beach lifestyle. Greg studied Marketing at CSU Fullerton and is extremely passionate about Photography and Hockey. When he’s not running our digital presses, he can be found on a scenic vista with camera in hand or on a plane on his way to his next adventure. Katie grew up in Baltimore, Maryland and spend 6 years living in Brighton, UK. Now happily settled in Orange County, she loves to go on hikes or to the beach with her husband Matt, daughter Quinn and Boston Terrier Moxie. 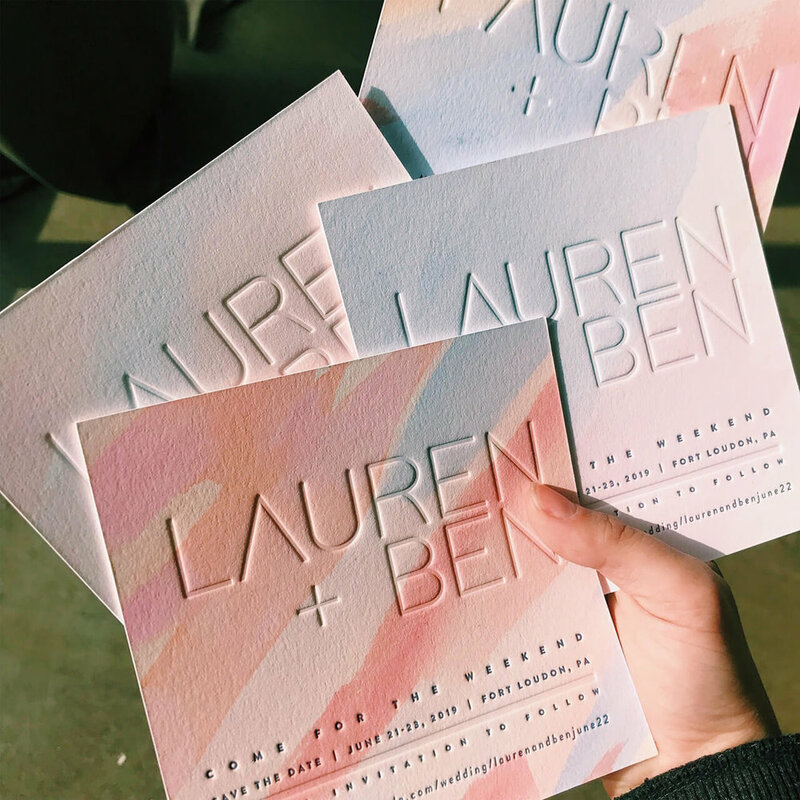 She has a BFA and an MFK from UMBC and a professional background in print design. Cameron was born and raised in the wine country of Sonoma, California. He studied Design at UC Davis and has worked as both an in-house and freelance Graphic Designer. He has a passion for anything related to basketball, hand-lettering, and video games. Brianna comes to us from the great city of Seattle, Washington. 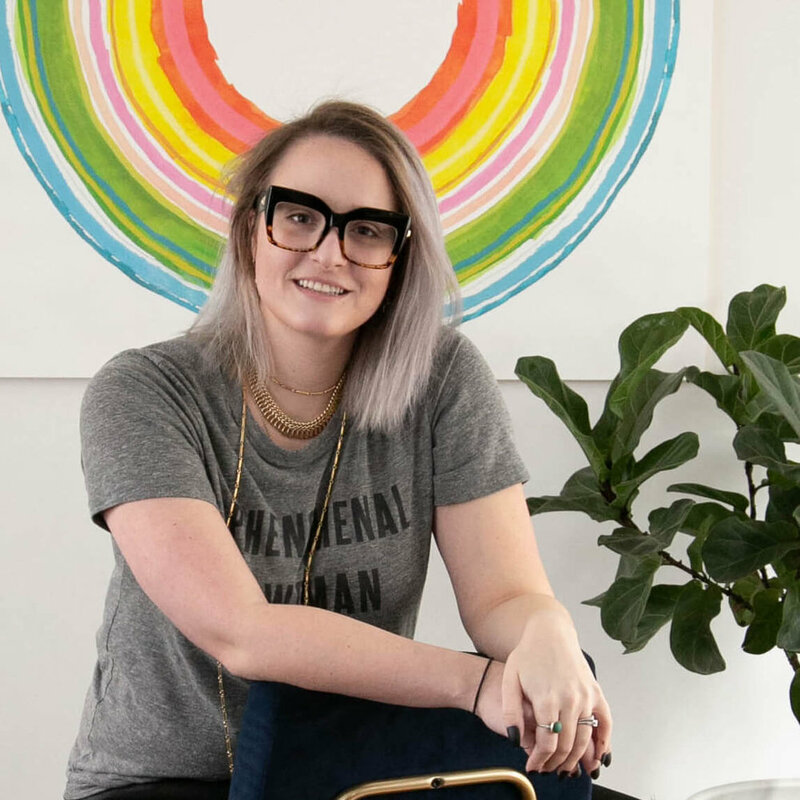 She earned a BFA in Interdisciplinary Studio Art from Biola University in 2018, and has a background in letterpress and printmaking. She loves to rock climb, visit museums, and you’ll never guess what else! Hailing from Puebla, Mexico, Gerry is a man of many hats, both literally and figuratively. He can do a little of just about everything in the shop. On a typical day he can be found edge-foiling, edge-painting, duplexing, screen printing, or die-cutting, all while moonlighting as a pianist. All the way from Mexico City, Mexico, Juan is our master of foil. Juan is a wizard when it comes to locking down tough registration and getting that beautiful, crisp foil coverage that our clients have come to expect from us. Outside of the shop he enjoys running and going to the gym. Ron is an Orange County native, but he is a man of many places and trades. Ron has a wealth of knowledge on just about everything. When he’s not letterpressing away with the fastest hands in the west, Ron enjoys the great outdoors and playing his Martin guitar. Pantone: No Pantones for Ron; he’s a blind letterpress sort of guy. Amy Hood - Hoodzpah Design Co.
One of the most common questions we get is, “How much does it cost for letterpress / foil stamping / screen printing etc.” The truth is that every job is unique and comes with its own considerations. 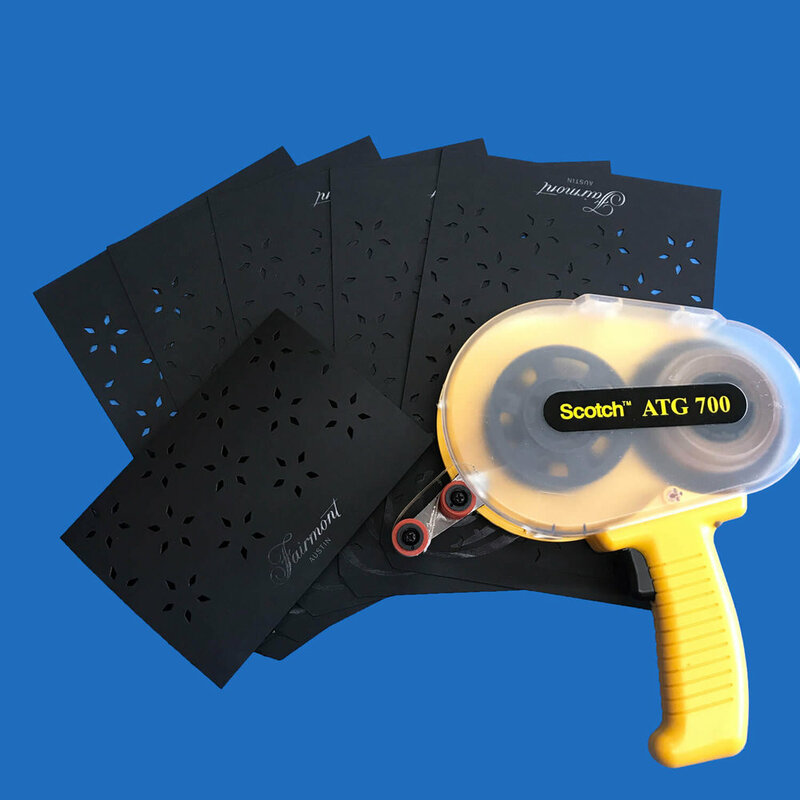 Prices can vary widely depending on paper, quantity, size, print process, and number of ink / foil colors. If you have a project that you would like to get an estimate on, an order that is ready to submit, or even just a few questions for us, fill out this form or shoot us an email at info@czarpress.com and we’ll get back to you as soon as possible. Not ready to place an order just yet? 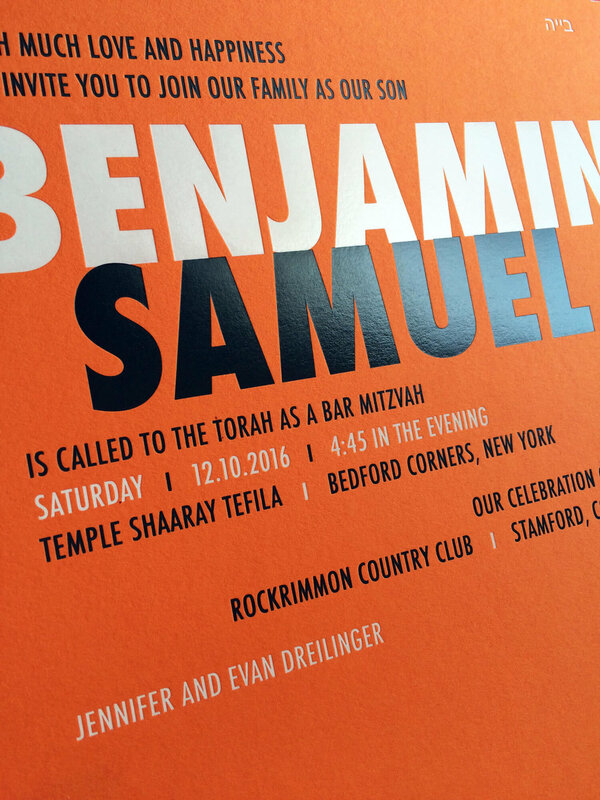 Still unsure of what paper and print process you want to go with? Come by and have a coffee on us! We’ve got all the samples, paper swatches, and pantone books that your heart desires and we’d be more than happy to help you iron out the details and get the ball rolling.